Think of Greece and what do you see? Perfect white sands, gloriously pink Aegean sunsets and lazy days spent poolside with an iced cocktail? It’s true, Greece does offer these delights in spades, but look beyond the beaches and you’ll find a rugged, sparsely-populated landscape dotted with dramatic gorges and mountain peaks and a setting for the odd adventure. After a long weekend in Athens, the obvious choice was to set sail for Santorini or Mykonos and spend the rest of our holiday sunning ourselves by the sea. But, as avid fans of the road less travelled, my husband David and I instead opted to hire a car and drive five hours due north to the Pindus Mountains, a little-visited corner of Greece up on the border with Albania, carpeted in dense conifer forests and home to wild wolves and bears. Our first stop was Meteora, whose name translates to ‘middle of the sky’ giving a hint as to what you might find here. We arrived in pitch black to our hotel in Kastraki, a small village, and so it wasn’t until the following morning, when I opened our curtains, that we saw the landscape. There in front of me was a cluster of monolithic pinnacles, their grey cliff edges standing out against the lush green and spring flowers around them. They jutted up like fingers from the valley, towering high above us. But what makes Meteora extra special are the six monasteries precariously balanced on the top of these pillars, built between the 11th and 16th centuries and leaving us wondering how on earth the raw materials were hauled up there to start with. The monasteries are linked by good roads, so exploring was easy – we drove between them, admiring the scenery and going inside two of them, Holy Trinity Monastery, shooting location for the 1981 James Bond film For Your Eyes Only, and the Monastery of Great Meteoron, the largest and supposedly most spectacular, although they all seemed pretty stunning to me. Each one offered far-reaching views across Kastraki and its neighbouring town Kalabaka, plus the distant snow-capped mountains. From Meteora, we drove what is considered Greece’s most scenic drive, across the Katara Pass. This took us 1,705m above sea level along deserted roads to Metsovo, a pretty mountain village that might have been in Switzerland, were it not for the moussaka and souvlaki (skewered meat) on offer in the restaurants. 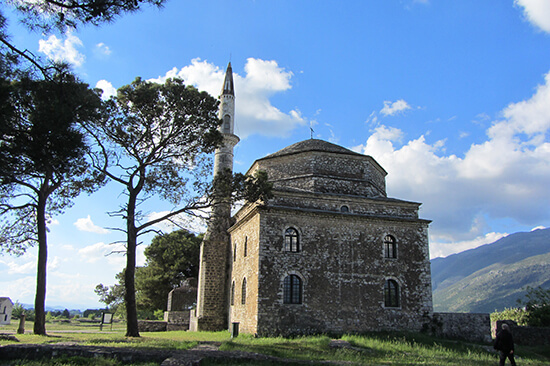 After a quick lunch, we pushed on along the winding mountain roads to Ioannina, a delightful lakeside town with a castle and two exquisite ottoman mosques. 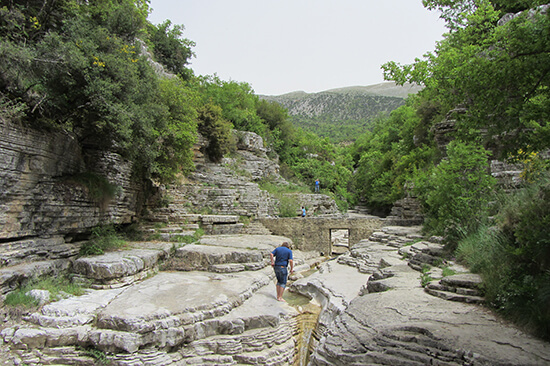 Our overnight stop was an hour further north in Papingo, a chocolate box village on the edge of Vikos–Aoös National Park. Papingo’s streets are so steep and narrow that cars are banned in the height of summer, but as we were there in May, we drove right in. I celebrated my birthday here, turning 33 with a litre of €5 Greek wine, a fried trout from the river and the most enormous (and fresh) Greek salad I ever saw. And very good it was too. 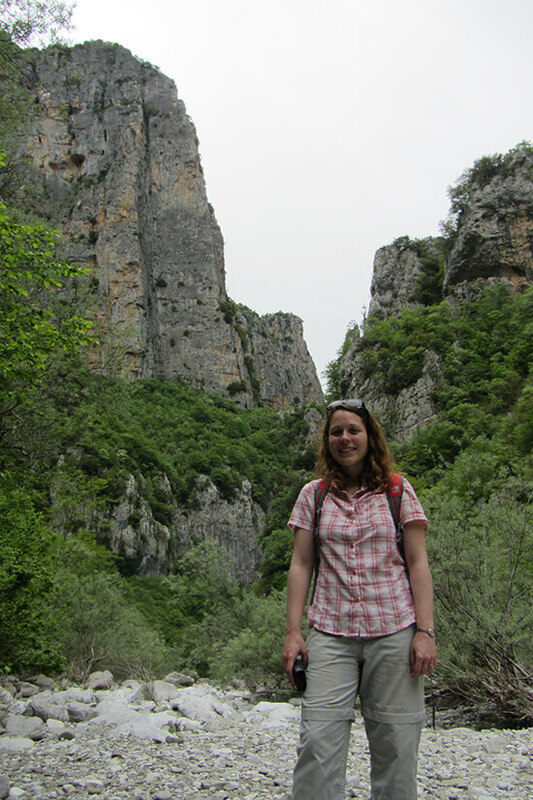 The following day, we hiked the Vikos Gorge. Few have heard of this geological feature, which seemed something of a mystery to us, because at 900m deep and 1,100m from rim to rim, it is the deepest gorge in the world. We set off walking from Monodendri, and saw not one soul from then until our return, almost eight hours later. It was just us, the cliffs, the river and the wildflowers. The hike was tough, with the first hour being straight downhill to the river, with the nagging thought in our minds that we’d have to hike back up it again at the end. But once at the river’s edge, we weren’t in a hurry, so strolled through the trees and stopped at the rock pools to admire the frogs, photograph the irises and watch the butterflies and bees flitter. Thankfully, the hike back up wasn’t as hard as we’d hoped, especially as we knew an iced tea and a bowl of tzatziki was waiting for us back in Monodendri. Before leaving Papingo we called in at the rock pools, a succession of natural ponds carved into the mountainside and filled with bright green water. 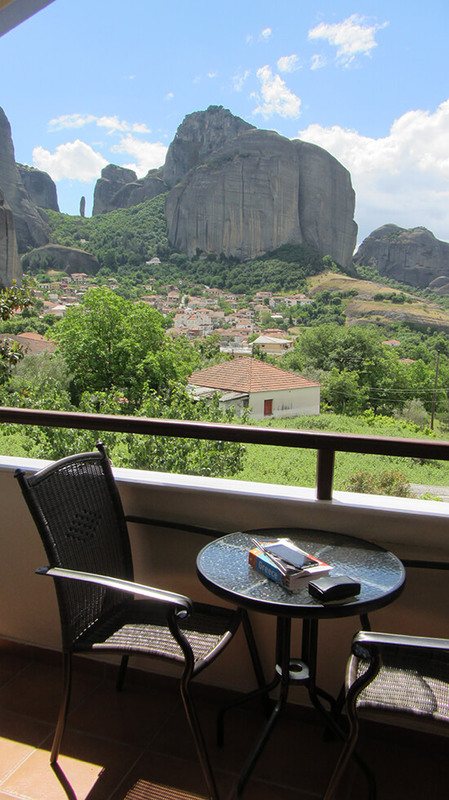 As our onward journey was a long one, we had to tear ourselves away pretty quickly, driving over four hours along the twisting and turning roads to Litochoro, on Greece’s east coast. 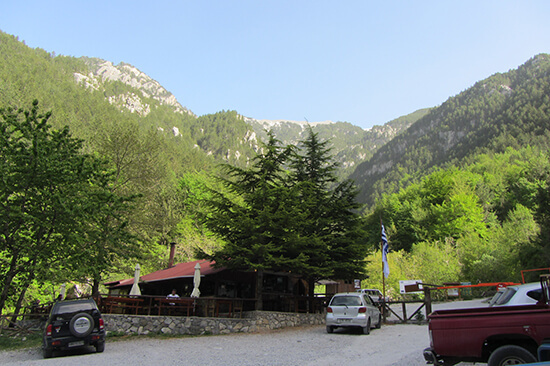 Here we parked at Prionia, the trailhead for the long hike to the summit of Mount Olympus, and set off walking. 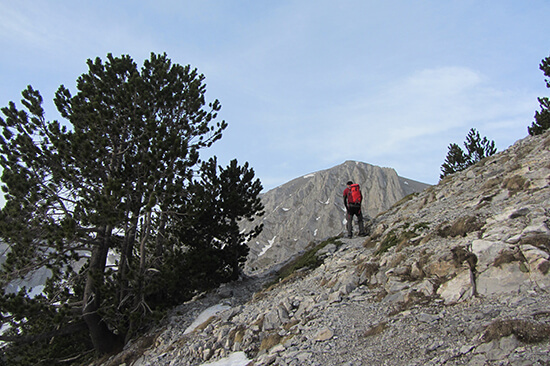 It took two and a half hours of relentless uphill climbing to reach Spilios Agapitos refuge, otherwise known as Refuge A, 2,100m above sea level. Exhausted, we tucked into huge bowls of spaghetti bolognaise, stocking up on the energy needed for our climb the next day, and watched the stars light up the night sky. When we awoke to bright sunshine and clear skies, we knew it was a good day for our summit attempt. We decided not to go for the highest peak, Mytikas (2,918m), as it was still covered in snow, and no-one had yet climbed it this season. 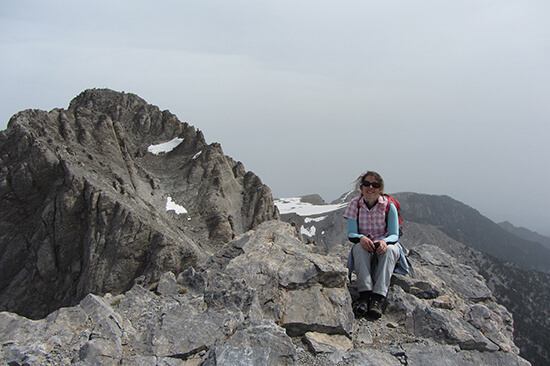 Instead we went for Skolio, 2,911m, the second highest of Mount Olympus’s three summits, the other being Stefani, at 2,902m. It wasn’t easy. The wind was howling, and the rock was loose, causing us to slip on many occasions. We were very glad of David’s crampons, which came in handy over the snowfields. Due to the steepness of the slopes around us, we couldn’t see the peak until we were almost on it, when we met another group (and two dogs!) coming back down and telling us tales of yet more deep snow. We went for it anyway, and eventually made it, panting and sweating to the top. From here we could see the Mytikas peak, with its extremely steep access route, and were very glad we had not attempted it. The view from Skolios more than made up for it, as we could see all the way to the sea in one direction and right across the Olympus Range in the other. The peaks were dramatic and jagged, almost threatening, not at all like the soft alpine peaks I am more familiar with. 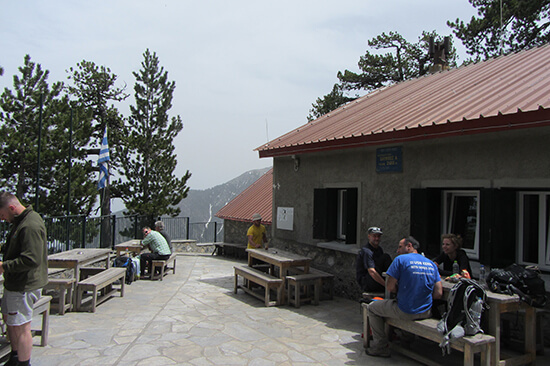 It took us six hours to get back down to Prionia, including a stop for lunch back at Refuge A. In Prionia we paused for a moment to admire the views of the Enipeas Gorge, where the deep blue Enipeas River flowed gently though the forests. We stayed our final night in Litochoro where, back at sea level, we were surprised by the heat and the crowds after a week in the almost deserted mountains. That evening, we tucked into fresh octopus and yet more Greek wine and toasted a successful week of exploring a part of Greece that few other tourists ever see. Learn all about our Greece and Europe holidays, as well as our group tours, with the help of one of our Travel Experts – make an appointment and start planning your trip now.